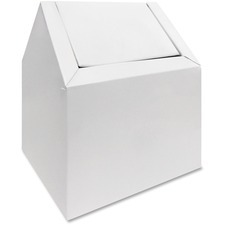 Feminine hygiene receptacle provides a sanitary way to dispose items in the restroom. Smooth, metal construction wipes down easily for quick cleanings. Swing-type door with double entry allows you to position this receptacle between stalls. Lightweight design provides an easy way to empty the container when filled.